Nidal Malik Hasan (born September 8, 1970) is an American convicted of fatally shooting 13 people and injuring more than 30 others in the Fort Hood mass shooting on November 5, 2009. Hasan was a United States Army Medical Corps psychiatrist who admitted to the shootings at his court-martial in August 2013. A jury panel of 13 officers convicted him of 13 counts of premeditated murder, 32 counts of attempted murder, and unanimously recommended he be dismissed from the service and sentenced to death. Hasan is incarcerated at the United States Disciplinary Barracks at Fort Leavenworth in Kansas awaiting execution. During the six years that Hasan was an intern and resident at Walter Reed Army Medical Center, colleagues and superiors were concerned about his job performance and comments. Hasan was not married at the time and was being described as socially isolated, stressed by his work with soldiers, and upset about their accounts of warfare. Two days before the shooting, which occurred less than a month before he was due to deploy to Afghanistan, Hasan gave away many of his belongings to a neighbor. Prior to the shooting, Hasan had expressed critical views described by colleagues as "anti-American". An investigation conducted by the Federal Bureau of Investigation (FBI) concluded that his e-mails with the late Imam Anwar al-Awlaki were related to his authorized professional research and that he was not a threat. The FBI, Department of Defense (DoD) and U.S. Senate all conducted investigations after the shootings. The DoD classified the events as "workplace violence", pending prosecution of Hasan in a court-martial. The Senate released a report describing the mass shooting as "the worst terrorist attack on U.S. soil since September 11, 2001". The decision by the Army not to charge Hasan with terrorism was controversial. Hasan was born in Arlington County, Virginia at Virginia Hospital Center to Palestinian parents who immigrated to the U.S. from al-Bireh in the West Bank. Raised as a Muslim together with his two younger brothers, he attended Wakefield High School in Arlington for his freshman year. After his family moved to Roanoke in 1985, he attended William Fleming High School in Roanoke, Virginia. He graduated from high school in 1988. Hasan and his brothers helped their parents run the family's restaurant in Roanoke. Their father died in 1998 and their mother in 2001. As adults, one brother continued to live in Virginia and the other moved to Jerusalem. Hasan joined the United States Army immediately after high school in 1988 and served eight years as an enlisted soldier while attending college. He graduated from Virginia Tech in 1997 with a bachelor's degree in biochemistry. He gained admission through a selective process for medical school at the Uniformed Services University of the Health Sciences ("USUHS" or "USU"). After earning his medical degree in 2003, Hasan completed his internship and residency in psychiatry at Walter Reed Army Medical Center. While an intern at Walter Reed, he received counseling and extra supervision. He studied for a Master in Public Health degree at USUHS with a two-year fellowship in Disaster and Preventive Psychiatry at the Center for Traumatic Stress at USUHS, which he completed in 2009. In May 2009, Hasan was promoted from captain to major. Before being transferred to Fort Hood in July 2009, he received a poor performance evaluation from supervisors and medical faculty  Despite these concerns, his former army boss, Lt. Col Ben Phillips, graded his performance as "outstanding", as revealed when Phillips was cross-examined during Hasan's trial. According to The Washington Post, Hasan made a presentation titled "The Quranic World View as It Relates to Muslims in the U.S. Military" during his senior year of residency at Walter Reed, which was not well received by some attendees. He suggested that the Department of Defense "should allow Muslims [sic] Soldiers the option of being released as "Conscientious objectors" to increase troop morale and decrease adverse events." On a previous slide he explained that "adverse events" could be refusal to deploy, espionage, or killing of fellow soldiers (as had occurred in Vietnam). Retired Colonel Terry Lee, who had worked with Hasan, later recalled that the fatal shooting of two recruiters in Little Rock, Arkansas greatly affected Hasan. The suspect Abdulhakim Mujahid Muhammad later claimed to be an Al Qaeda terrorist. He was charged with murder. Lee told Fox News that Hasan made "outlandish" statements against the American military presence in Iraq and Afghanistan, that "the Muslims should stand up and fight against the aggressor", referring to the United States. After 2004, Hasan became more agitated, and frequently argued with soldiers. He expressed hope that President Barack Obama would withdraw troops. His relatives in Israel and the U.S. who spoke to the press portrayed him as a quiet, peace-loving and deeply religious man who served his country proudly, but suffered from religious harassment. Cousin Nader Hasan disputed that Hasan had ever been "disenchanted with the military," but that he dreaded war after counseling soldiers who had returned with post-traumatic stress disorder. He was "mortified by the idea" of deploying after having been told on a "daily basis the horrors they saw over there". Nader claimed that Hasan had been harassed by his fellow soldiers. "He hired a military attorney to try to have the issue resolved, pay back the government, to get out of the military. He was at the end of trying everything." Hasan's aunt also said that Hasan sought discharge because of harassment relating to his Islamic faith. An army spokesman could not confirm the relatives' statements; the deputy director of the American Muslim Armed Forces and Veterans Affairs Council said that the reported harassment was "inconsistent" with their records. His uncle Rafiq Hamad, who lives in Ramallah in the West Bank, said Hasan was a gentle and quiet man who fainted while observing childbirth, which was why he chose psychiatry. He was deeply sensitive and mourned a pet bird for months after it died. Also near Ramallah, cousin Mohammed Hasan said that "because he's a Muslim he didn't want to go to Afghanistan or Iraq and he didn't want to expose himself to violence and death". Mohammed stated his cousin was a "pleasant young man" who was happy to have graduated and to be joining the army after his uncle and cousins had also served. They never talked about politics, but Hasan had complained that "he was being treated like a Muslim, like an Arab, rather than an American; he was being discriminated against." In August 2009, according to a Killeen, Texas police report, someone vandalized Hasan's automobile with a key; repair was estimated at $1000. Police charged a soldier, who a neighbor said vandalized the vehicle because of Hasan's religion. According to military records, Hasan was unmarried. However, David Cook, a former neighbor, said around 1997 Hasan had two sons living with him and attending local schools. Cook said, "As far as I know, he was a single father. I never saw a wife." Hasan received the Army Service Ribbon as a private in 1988 after completing Advanced Individual Training (AIT), the National Defense Service Medal twice for service during the time periods of the Persian Gulf War and the War on Terror, and the Global War on Terrorism Service Medal for support service during the War on Terror. According to one of his cousins, Hasan was a practicing Muslim who became more devout after his parents died in 1998 and 2001. His cousin did not recall him ever expressing any radical or anti-American views, and family also described Hasan as a peaceful person, and a good American. One of his cousins said Hasan turned against the wars after hearing the stories of soldiers whom he treated in therapy following their return from Afghanistan and Iraq. His aunt said that he did not tell the family he was being deployed to Afghanistan. In May 2001, Hasan attended the Dar al-Hijrah mosque in the Falls Church area for the funeral of his mother and occasionally after that. One of his brothers lived in Virginia but Hasan generally attended a mosque in Silver Spring, Maryland, closer to where he lived and worked, where he was well known by the imam over a period of ten years. Faizul Khan, the former imam of the Silver Spring mosque where Hasan prayed several times a week, said he was "a reserved guy with a nice personality. We discussed religious matters. He was a fairly devout Muslim." Khan said Hasan often expressed his wish to get married, and the imam said, "I got the impression that he was a committed soldier." From January 2001 to 2002, Anwar al-Awlaki was the imam of the Dar al-Hijrah mosque; he was then considered a moderate. Also serving as the Muslim chaplain at George Washington University, he was frequently invited to speak about Islam to audiences in Washington, DC and to members of Congress and the government. Hasan reportedly has deep respect for al-Awlaki's teachings. From December 2008 on, Hasan sent Awlaki as many as 20 e-mail messages, but a counter-terrorism specialist who reviewed the e-mails at the time considered that "they were consistent with authorized research Major Hasan was conducting." Al-Awlaki said, "Maybe Nidal was affected by one of my lectures." He added: "It was clear from his e-mails that Nidal trusted me. Nidal told me: 'I speak with you about issues that I never speak with anyone else.'" Al-Awlaki said Hasan arrived at his own conclusions regarding the acceptability of violence in Islam, and said he was not the one to initiate this. Shaea summarized their relationship by saying, "Nidal was providing evidence to Anwar, not vice versa." Hasan's psychiatry master's fellowship at USUHS was in Disaster and Preventive Psychiatry. The Air Force Lt. Col. Dr. Val Finnell, a graduate school classmate in the Master's in Public Health program, said that in a class on environmental health, Hasan's project dealt with "whether the war on terror is a war against Islam" and the effect on Muslims in the military, which Finnell thought was strange. According to Colonel Terry Lee, since retired, "He [Hasan] said 'maybe Muslims should stand up and fight against the aggressor'. At first we thought he meant help the armed forces, but apparently that wasn't the case. Other times he would make comments we shouldn't be in the war in the first place." Hasan's business card left in his apartment describes him as a psychiatrist specializing in Behavioral Health – Mental Health – Life Skills, and contains the acronyms SoA(SWT). According to investigators, the acronym "SoA" is commonly used on jihadist websites as an acronym for "Soldier of Allah" or "Servant of Allah," and SWT is commonly used by Muslims to mean "subhanahu wa ta'ala" (Glory to God). A review of Hasan's computer and his multiple e-mail accounts revealed visits to websites espousing radical Islamist ideas, a senior law enforcement official said. Hasan had come to the attention of federal authorities at least six months before the attacks, because of internet postings he appeared to have made discussing suicide bombings and other threats, though authorities did not at the time definitively tie the postings to him. The postings, made in the name "NidalHasan", likened a suicide bomber to a soldier who throws himself on a grenade to save his colleagues, and sacrifices his life for a "more noble cause". No official investigation was opened. ABC News reported that officials were aware that Hasan had attempted to contact Al Qaeda, and that Hasan had "more unexplained connections to people being tracked by the FBI" than just Anwar al-Awlaki. Major Hasan expressed concern about the actions of some of the soldiers he was evaluating as a military psychiatrist. Days before he opened fire at Fort Hood in 2009, Major Hasan asked his supervisors and Army legal advisers how to handle reports of soldier's deeds in Afghanistan and Iraq that disturbed him. Hasan was investigated by the FBI after intelligence agencies intercepted at least 18 e-mails between him and Anwar al-Awlaki between December 2008 and June 2009. al-Awlaki was a major influence on radical English-speaking jihadis internationally, and contact with him by an American officer would naturally raise concerns. In one of the e-mails, Hasan wrote al-Awlaki: "I can't wait to join you" in the afterlife. Hasan also asked al-Awlaki when jihad is appropriate, and whether it is permissible if innocents are killed in a suicide attack. In the months before the shooting, Hasan increased his contacts with al-Awlaki to discuss how to transfer funds abroad without coming to the attention of law authorities. A DC-based Joint Terrorism Task Force operating under the FBI was notified of the e-mails. Its Defense Criminal Investigative Service personnel reviewed the material. Army employees were informed of the e-mails, but did not perceive any terroristic threat in Hasan's questions. Instead, they viewed them as general questions about spiritual guidance with regard to conflicts between Islam and military service, and judged them to be consistent with his legitimate mental health research about Muslims in the armed services. The assessment was that the material did not call for a larger investigation. Defense Department higher-ups said they were not notified of the investigations before the shootings. A senior government official said to ABC News that Hasan had contact with other people being tracked by the FBI, who have not been publicly identified. I find it difficult to understand why an Army major would be in repeated contact with an Islamic extremist like Anwar al-Awlaki, who preaches a hateful ideology directed at inciting violence against the United States and the West ... It is hard to see how repeated contact would in any legitimate way further his research as a psychiatrist. And former CIA officer Bruce Riedel opined: "E-mailing a known al-Qaeda sympathizer should have set off alarm bells. Even if he was exchanging recipes, the bureau should have put out an alert." Al-Awlaki had set up a website, with a blog on which he shared his views. On December 11, 2008, he condemned any Muslim who seeks a religious decree "that would allow him to serve in the armies of the disbelievers and fight against his brothers." The NEFA Foundation noted that on December 23, 2008, six days after he said Hasan first e-mailed him, al-Awlaki wrote on his blog: "The bullets of the fighters of Afghanistan and Iraq are a reflection of the feelings of the Muslims towards America." A fellow Muslim officer at Fort Hood said Hasan's eyes "lit up" when speaking about al-Awlaki's teachings. Some investigators believe that Hasan's contacts with al-Awlaki are what pushed him toward violence at a time when he was suffering depression and stress. In the Fort Hood shooting, on November 5, 2009, Hasan reportedly shouted "Allahu Akbar!" (The phrase literally means "God is the greatest"); and opened fire in the Soldier Readiness Center of Fort Hood, located in Killeen, Texas, killing 13 people and wounding over 30 others in the worst shooting ever to take place on an American military base. Department of the Army Civilian Police Sergeant Kimberly D. Munley encountered Hasan exiting the building in pursuit of a wounded soldier. Munley and Hasan exchanged shots; Munley was hit twice, in her thigh and in her knee, knocking her to the ground. In the meantime, Sergeant Mark Todd, also of the DACP, arrived and fired at Hasan, who was hit and felled by shots from Todd. Todd approached Hasan and kicked the pistol out of his hand. Hasan was placed in handcuffs as he fell unconscious. The incident lasted about 10 minutes. Hasan was to be deployed to Afghanistan, contrary to earlier reports that he was to go to Iraq, on November 28. Prior to the incident, Hasan told a local store owner that he was stressed about his imminent deployment to Afghanistan since he might have to fight or kill fellow Muslims. According to Jeff Sadoski, spokesperson of U.S. Senator Kay Bailey Hutchison, "Hasan was upset about his deployment". Hasan gave away furniture from his home on the morning of the shooting, saying he was going to be deployed on Friday. He also handed out copies of the Quran. Kamran Pasha wrote about a Muslim officer at Fort Hood who said he prayed with Hasan on the day of the Fort Hood shooting, and that Hasan "appeared relaxed and not in any way troubled or nervous". This officer believed that the shootings may have been motivated by religious radicalism. Hasan was initially hospitalized in the intensive care unit at Brooke Army Medical Center at Fort Sam Houston in San Antonio, Texas, under heavy guard, with his condition described as "stable". News reports on November 7, 2009, indicated that he was in a coma. On November 9, Brooke Army Medical Center spokesman Dewey Mitchell announced that Hasan had regained consciousness, and been able to talk since he was taken off a ventilator on November 7. On November 13, Hasan's attorney, John Galligan, announced that Hasan was paralyzed from the waist down from the bullet wounds to his spine, and would likely never walk again. In mid-December, Galligan indicated that Hasan was moved from intensive care to a private hospital room, yet still remained under guard while recovering. Galligan further stated that doctors said Hasan would need at least two months in the hospital to learn "to care for himself". On November 7, 2009, while Hasan was communicative, he refused to talk to investigators. On November 12 and December 2, respectively, Hasan was charged with 13 counts of premeditated murder and 32 counts of attempted murder under the Uniform Code of Military Justice, thus making him eligible for the death penalty if convicted. Hasan was not charged with the murder of Private Francheska Velez's unborn child. Although authorities did not specify at that time if they would seek the death penalty in the case, a senior military official who spoke on the condition of anonymity said that Colonel Michael Mulligan would serve as the Army's lead prosecutor. Mulligan served as the lead prosecutor on the Hasan Akbar case, in which a soldier was sentenced to death for the murder of two officers. John P. Galligan, a retired Army JAG colonel, initially represented Hasan. On November 21, in a hearing held in Hasan's hospital room, a military magistrate ruled that there was probable cause that Hasan committed the shooting spree at Fort Hood, and ordered him to pretrial confinement until his court martial. Hasan remained in intensive care in accordance with the magistrate's order. On November 23, Galligan said that Hasan would likely plead not guilty to the charges against him and may use an insanity defense at his court martial. Army officials initially stated that doctors would evaluate Hasan by mid-January 2010 to determine his competency to stand trial as well as his mental state at the time of the shooting, but delayed the exam on request from Galligan until after the Article 32 hearing. The Army imposed restrictions on Hasan that he speak only in English on the phone or with visitors unless an interpreter was present. Hasan was moved from Brooke Army Medical Center to the Bell County Jail in Belton, Texas, on April 9, 2010. Fort Hood negotiated a renewable $207,000 contract with Bell County in March to house Hasan for six months. Galligan announced that the Army officers prosecuting the case would seek the death penalty, stating, "It is the first 'formal notice' but, of course, it has been a virtual given from the start. In short, the Army has been pursuing death from the git-go." The prosecutors filed a memo on April 28, 2010, stating that the "aggravating factor" necessary for pursuit of the death penalty will be satisfied if Hasan is found guilty of more than one murder. The decision to seek the death penalty followed the Article 32 hearing. On September 15, 2010, Hasan's attorney stated he intended to seek a closed court hearing during those proceedings. On October 12, 2010, Hasan was due to appear for his first broad military hearing into the attack. The hearing, formally called an Article 32 proceeding, akin to a grand jury hearing but open to the public, was expected to span four to six weeks. The hearing, designed to help the top Army commander at Ft. Hood determine whether there was enough evidence to court-martial Hasan, was scheduled to begin calling witnesses but was delayed by scheduling and procedural disputes. The hearing proceeded on October 14 with witness testimonies from soldiers who survived the shootings. On November 15, the military hearing ended when Galligan declined to offer a defense case, on the grounds that the White House and Defense Department refused to hand over documents he requested pertaining to an intelligence review of the shootings. Neither the defense nor prosecution offered to deliver a closing argument. On November 18, Colonel James L. Pohl, who served as the investigating officer for the Article 32 hearing, recommended that Hasan be court-martialed and face the death penalty. His recommendation was forwarded to another U.S. Army Colonel at Ft. Hood, who, after filing his own report, presented his recommendation to the post commander. The post commander made the final decision on whether Hasan would face a trial and the death penalty. On July 6, 2011, the Fort Hood post commander referred the case to a general court-martial, authorized to consider the death penalty. On July 27, 2011, Fort Hood Chief Circuit Judge Colonel Gregory Gross set a March 5, 2012, trial date. Hasan declined to enter any plea and Judge Gross granted a request by Hasan's attorneys to defer the plea to an unspecified date. Hasan notified Gross that he had released John Galligan, the civilian attorney who had been his lead attorney in previous court appearances, choosing to be represented by three military lawyers. On February 2, 2012, a military judge delayed trial until June 12, 2012. Lt.Col. Kris Poppe, Hasan's lead attorney, said the request to delay the trial was "purely a matter of necessity of adequate time for pretrial preparation". On April 10, 2012, Hasan's lawyers requested another continuance to move the trial start date from June to late October in order to review the large volume of paperwork and evidence and interview more witnesses. Gross agreed to take the request under advisement. Judge Gross denied a defense motion seeking a Defense Initiated Victim Outreach specialist to testify, Fort Hood officials said. The new program is intended to help the defense respond to the needs of survivors and victims' families and possibly change their attitudes if they support the death penalty. Gross also denied a defense request to force prosecutors to provide notes from meetings and conversations with President Barack Obama, the defense secretary and other high-ranking government officials after the November 5, 2009, shootings. Defense attorneys had argued they want to determine if anything was discussed that may have unlawfully influenced Hasan's chain of command to prosecute him. On April 18, 2012, Judge Gross granted the defense motion for a continuance in part, rescheduling the trial for August 20, 2012. In July 2012, having previously instructed Hasan to follow army regulations and shave his beard grown during the past several months, the judge found Hasan in contempt of court and fined him. He was fined once more for retaining his beard, and was warned by Judge Colonel Gregory Gross, that he could be forcibly shaved prior to his court-martial. On August 15, Hasan was scheduled to enter pleas to the charges brought against him before the beginning of the court-martial; he would not be allowed to plead guilty for the premeditated murder charges as the prosecution is pursuing the death penalty in his case. The hearing and the preceding court-martial was delayed by Hasan's objections to being shaved against his will, and his appeal to the United States Court of Appeals for the Armed Forces regarding the matter; through his attorneys, Hasan said that his beard is part of his religious beliefs. The prosecutors argued that Hasan was simply trying to delay his trial. On August 27, the Appeals Court announced that the trial could continue, but did not rule whether Hasan could be forcibly shaved nor did they set a new date for the start of the trial. The Appeals Court had rejected previous attempts by Hasan to receive "religious accommodation" to wear his beard. On September 6, Colonel Gross ruled that Hasan be forcibly shaved after it was determined that the 1993 Religious Freedom Restoration Act did not apply to this case; however, it will not be enforced until all of Hasan's appeals are exhausted. During the September 6 hearing, Hasan twice offered to plead guilty, however U.S. Army rules prohibit the judge from accepting a guilty plea in a death penalty case. Hasan remained incarcerated and in a wheelchair. He continued to receive paychecks, and his medical expenses are paid by the military. On June 3, 2013, a military judge allowed Hasan to represent himself at his upcoming murder trial. His attorneys were to remain on the case but only if he asked for their help. Jury selection was set to start on June 5 and opening arguments were scheduled to begin on July 1. U.S. Army Judge Colonel Tara Osborn ruled on June 14, 2013, that Hasan could not claim as a part of his defense that he was defending the Taliban. In a statement released to Fox News, Hasan justified his actions during the Fort Hood shooting by claiming that the US military was at war with Islam. During the first day of the trial on August 6, Hasan—who was representing himself— admitted that he was the gunman during the Fort Hood shootings in 2009 and stated that the evidence would show that he was the shooter. He also told the panel hearing that he had "switched sides" and regarded himself as a Mujahideen waging "jihad" against the United States. By August 7, disagreements between Hasan and his stand-by defense team led Judge Osborn to temporarily suspend the proceedings. Hasan's defense attorneys were concerned that Hasan was trying to help prosecutors achieve a death sentence. Since the prosecution had sought the death penalty, his defense team sought to prevent this. On August 8, Judge Osborn ruled that Hasan could continue to represent himself during the trial and rejected his standby defense team's requests that they take over Hasan's defense or have their roles reduced. The judge also declined the defense lawyers' request that they be removed from the case. On August 9, Hasan allowed two of his three standby defense lawyers—Lieutenant Colonel Christopher Martin and Major Joseph Marcee—to seek leave in order to prepare an appeal arguing that the defendant was seeking the death penalty, thus undermining their rules of "professional conduct". His third attorney Lieutenant Colonel Kris Poppe remained behind to observe the court proceedings. Court proceedings also resumed with the prosecution presenting testimonies from several soldiers who had survived the Fort Hood shooting. By August 14, more than 60 prosecution witnesses had testified and all had identified Hasan as the shooter. Court proceedings were speedy since Hasan raised few objections and declined to cross-examine most of the witnesses. By August 13, prosecutors had shifted to presenting forensic evidence with FBI agents present at the crime scene testifying that they had found so much evidence at the crime scene that they ran out of markers. This evidence included 146 shell casings and six magazines. The New York Times also published remarks by Hasan from a mental health report supplied by the defendant's civil attorney John Galligan. According to these documents, Hasan told medical health experts in 2010 that he "would still be a martyr" even if he was convicted and executed by the US government. Hasan, acting as his own defense lawyer, had offered to share the report with prosecutors during his court martial. However, on August 14, Judge Osborn blocked prosecutors from seeing the report. On August 19, she also excluded prosecuting evidence relating to Hasan's early radicalization and evidence which presented the Fort Hood shooting as a "copycat" based on the actions of Hasan Akbar, a Muslim U.S. Army soldier sentenced to death for attacking fellow soldiers prior to the Iraq War. On August 20, 2013, the prosecution rested its case against Hasan. They had called nearly 90 witnesses over 11 days with the fast pace of proceedings being attributed to Hasan's refusal to cross-examine most of the witnesses. Throughout the proceedings, he only questioned three witnesses. While the defense had been scheduled to present its case on Wednesday, Hasan indicated that he had no plans to call any defense witnesses. Earlier, he had planned to call two defense witnesses: one a mitigation expert in capital murder cases and the other a California professor, specializing in philosophy and religion. Hasan also formally declined to argue that the prosecution had not proven its case. Ultimately, Hasan did not call any witnesses or testify in his own defense and rested his defense on August 21, 2013. On August 22, 2013, Hasan declined to give a closing argument. [Hasan] can never be a martyr because he has nothing to give ... Do not be misled; do not be confused; do not be fooled. He is not giving his life. We are taking his life. This is not his gift to God, it's his debt to society. He will not now and will not ever be a martyr. The jury panel then reconvened to decide on sentencing. On August 28, 2013, the jury panel recommended Hasan be sentenced to death. The panel also recommended Hasan forfeit his military pay and be dismissed from the Army, a separation for officers carrying the same consequences as a dishonorable discharge. Al-Awlaki posted this as part of a lengthy message on a website that has since been made inoperable by the web host. Mujahid brother ... has shown us what one righteous Muslim with an assault rifle can do for his religion and brothers in faith ... is a pioneer, a trailblazer and a role-model ... and yearns to discharge his duty to Allah and play a part in the defense of Islam and Muslims against the savage, heartless and bloody Zionist Crusader assault on our religion, sacred places and homelands. Hours before the attack, CNN happened to have posted an interview and video of a New York group, Revolution Muslim, in which Younes Abdullah Mohammed (a Jewish-American convert to Islam) spoke outside a New York mosque, saying that US troops were "legitimate targets", and that Osama bin Laden was their model. The evening after the attack, Revolution Muslim posted support for Hasan on its website, one of the few American sites to do so. In the video RM described American soldiers in the video as "slain terrorists in the eternal hellfire". National American Muslim organizations strongly condemned the group. A statement issued by the Ansar Al-Mujahideen Network, another extremist group, on November 24, 2009, cited Hasan as a role model. It congratulated him for his "brave and heroic deed" for standing up to the "modern Zionist-Christian Crusades" against the Muslim community. A military activist, Selena Coppa, said: "This man was a psychiatrist and was working with other psychiatrists every day and they failed to notice how deeply disturbed someone right in their midst was." Philip Sherwell and Alex Spillius, reporters for The Telegraph, wrote, "many of the characteristics attributed to Hasan by acquaintances—withdrawn, unassuming, brooding, socially awkward and never known to have had a girlfriend—have also applied to other mass murderers." Hasan's perceived beliefs were also cause for concern among some of his peers. According to an unnamed source, Hasan was disciplined for "proselytizing about his Muslim faith with patients and colleagues", while at Uniformed Services University of the Health Sciences (USUHS); The Telegraph reported an incident in which some attendees felt one of his lectures, expected to be of a medical nature, became a diatribe against "infidels". Air Force doctor Val Finnell, a former medical school classmate who had complained to superiors about Hasan's "anti-American rants", said: "The system is not doing what it's supposed to do. He at least should have been confronted about these beliefs, told to cease and desist, and to shape up or ship out." Before the contents of the e-mails were revealed, Jarret Brachman, a scholar of terrorism, said that Hasan's contacts with al-Awlaki should have raised "huge red flags". According to Brachman, al-Awlaki is a major influence internationally on English-speaking jihadists. The Dallas Morning News reported on November 17 that ABC News, citing anonymous sources, reported that investigators suspect that the shootings were triggered by the refusal of Hasan's superiors to process his requests that sought to have some of his patients prosecuted for war crimes based on statements they made during psychiatric sessions with him. Dallas attorney Patrick McLain, a former Marine, opined that Hasan may have been legally justified in reporting what patients disclosed, but that it was impossible to be sure without knowing exactly what was said. Some fellow psychiatrists had complained to superiors that Hasan's requests violated physician–patient privilege. "real tragedy" would be harming the cause of diversity, saying, "As great a tragedy as this was, it would be a shame if our diversity became a casualty as well." Several months later, in a February 2010 interview, Casey said, "Our diversity—not only in our Army, but in our country, is a strength. And as horrific as this tragedy was, if our diversity becomes a casualty, I think that's worse." FBI Director Robert Mueller appointed William Webster, a former director of the FBI, to conduct an independent review of the bureau's handling of investigations related to Hasan and whether it missed signs of an attack. Webster was selected for the job due to being, as Mueller stated, "uniquely qualified" for such a review, and the Webster Commission's final report made several recommendations including written policies clarify ownership of leads, integration of databases, and acquiring search capabilities for all relevant databases based on computational analysis of textual data to replace simple keyword searches. if the reports that we're receiving of various statements he made, acts he took, are valid, he had turned to Islamist extremism ... if that is true, the murder of these 13 people was a terrorist act ... I think it's very important to let the Army and the FBI go forward with this investigation before we reach any conclusions. The November 23 cover of the European and U.S. editions of Time magazine featured a photograph of Hasan, with the title "Terrorist?" over his eyes. Nancy Gibbs reported the cover story: "Hasan matched the classic model of the lone, strange, crazy killer: the quiet and gentle man who formed few close human attachments." She noted, "Hasan's motives were mixed enough that everyone with an agenda could find markers in the trail he left." Bruce Hoffman, a terrorism scholar and Georgetown University professor, told Gibbs that "I used to argue it was only terrorism if it were part of some identifiable, organized conspiracy ... the nature of terrorism is changing, and Major Hasan may be an example of that". The Christian Science Monitor also questioned whether Hasan was a terrorist. On November 14, The New York Times asked: "Was Major Hasan a terrorist, driven by religious extremism to attack fellow soldiers he had come to see as the enemy? Was he a troubled loner, a misfit who cracked when ordered sent to a war zone whose gruesome casualties he had spent the last six years caring for? Or was he both?" The reporters write, "Major Hasan may be the latest example of an increasingly common type of terrorist, one who has been self-radicalized with the help of the Internet and who wreaks havoc without support from overseas networks and without having to cross a border to reach his target." Following his conviction and sentencing, Nidal Hasan was incarcerated at the United States Disciplinary Barracks at Fort Leavenworth in Kansas to await execution. According to Chris Haug, Fort Hood's Chief of Media Relations, Hasan was also stripped of his rank and dismissed from the US Army. Hasan would only be referred to as "Inmate Nidal Hasan" going forward. On September 5, 2013, it was reported in several news media that Hasan had his beard forcibly shaved. Fort Leavenworth authorities justified their decision by citing that Hasan would be subject to Army regulations even though he had been dismissed from the Army and reduced to the lowest pay grade and forfeited all pay and allowances. Despite Army regulations banning personnel from having facial hair, Hasan had begun growing a beard following the Fort Hood Shooting in 2009 by citing his religious beliefs. Although no new photos of Hasan have been released since his incarceration, military authorities have confirmed that a video recording of the forced shaving exists, as per military regulations. In response, John Galligan, Hasan's former civilian lawyer, had planned to sue the military for violating his religious beliefs. Galligan argued that a military council in 2012 had allowed Hasan to keep his beard for the duration of the trial and dismissed the Army's actions as vindictive. On August 28, 2014, his attorney said Hasan had written a letter to Abu Bakr al-Baghdadi (head of the Islamic State of Iraq and the Levant (ISIS). In the letter, Hasan requested to be made a citizen of the Islamic State and included his signature and the abbreviation SoA (Soldier of Allah). ^ James C. McKinley Jr.; James Dao (November 8, 2009). "Fort Hood Gunman Gave Signals Before His Rampage". The New York Times. New York. ^ Hasan testified at his court-martial that he had "switched sides" and regarded himself as a Mujahideen waging "jihad" against the United States. Allen, Nick (August 6, 2013). "'I am the shooter': US army major Nidal Hasan declares as he faces court martial over Fort Hood massacre". The Daily Telegraph. London. The Telegraph (UK). Retrieved March 24, 2015. ^ a b c d Janda, Greg (September 5, 2013). "Fort Hood shooter Nidal Hasan dishonorably discharged, no longer major". NBCDFW.com. Retrieved September 6, 2013. ^ Rubin, Josh (August 6, 2013). "'I am the shooter,' Nidal Hasan tells Fort Hood court-martial". CNN. Retrieved August 7, 2013. ^ a b "Army releases May officer promotions". Military Times. April 22, 2009. Retrieved November 5, 2009. ^ a b McKinley, Jr., James (November 12, 2009). "Suspect in Fort Hood Attack Is Charged on 13 Murder Counts". The New York Times. ^ a b "Army adds charges against rampage suspect". MSNBC. December 2, 2009. Retrieved December 3, 2009. ^ Jeff Brady (November 11, 2009). "Portrait Emerges Of Hasan As Troubled Man". National Public Radio. Retrieved March 15, 2016. ^ a b "Maj. Nidal M. Hasan's Official Military Record". Newsweek. Retrieved December 18, 2013. ^ McKinley, Jr., James C.; Dao, James (November 8, 2009). "Fort Hood Gunman Gave Signals Before His Rampage". The New York Times. Retrieved November 9, 2009. ^ a b "Lawmakers' briefing causes confusion on wounded". Seattle Times. Associated Press. November 6, 2009. ^ Jervis, Rick; Stanglin, Doug (August 23, 2013). "Nidal Hasan found guilty in Fort Hood killings". USA Today. Retrieved August 23, 2013. ^ John Pike. "A Ticking Time Bomb Counterterrorism Lessons From The U.S. Government'S Failure To Prevent The Fort Hood Attack". Globalsecurity.org. Retrieved March 16, 2012. ^ Heather Somerville, Contributor (February 3, 2011). "Opinion: Fort Hood attack: Did Army ignore red flags out of political correctness?". Christian Science Monitor. Csmonitor.com. Retrieved March 16, 2012. ^ Myers, Dee Dee. "Is Nidal Hasan a Terrorist or Not?". Vanity Fair. Retrieved March 16, 2012. ^ Friedman, Emily; Richard Esposito; Ethan Nelson; Desiree Adib; Ammu Kannampilly (November 6, 2009). "Army Doctor Nidal Malik Hasan Allegedly Kills 13 at Fort Hood". ABC News. Retrieved November 6, 2009. ^ a b c d Dao, James (November 5, 2009). "Suspect Was 'Mortified' About Deployment". New York Times. Retrieved November 7, 2009. ^ a b c Casselman, Ben; Zimmerman, Ann; Bustillo, Miguel (November 6, 2009). "A Helper With Worries of His Own". Wall Street Journal. Retrieved November 6, 2009. ^ "Profile: Major Nidal Malik Hasan". BBC. November 12, 2009. ^ "Maj. Nidal M. Hasan". The Washington Post. November 7, 2009. Retrieved March 23, 2010. ^ a b Hammack, Laurence; Amanda Codispoti; Tonia Moxley (November 7, 2009). "Fort Hood shooting suspect Hasan left few impressions in schools he attended". The Roanoke Times. Archived from the original on April 13, 2013. Retrieved April 2, 2013. ^ Mckinley, James C. (November 8, 2009). "McKinley, Jr., James C, and Dao, James, "Fort Hood Gunman Gave Signals Before His Rampage", New York Times, November 9, 2009". The New York Times. Retrieved March 16, 2012. ^ a b c d Blackledge, Brett J. (November 6, 2009). "Who is Maj. Nidal Malik Hasan?". Fox News. Archived from the original on September 6, 2013. Retrieved April 2, 2013. ^ Blackledge, Brett J. (November 6, 2009). "Details emerge about Fort Hood suspect's history". Associated Press. Retrieved November 6, 2009. ^ a b c Mckinley, James C.; DAO, James (November 8, 2009). "Fort Hood Gunman Gave Signals Before His Rampage". The New York Times. Retrieved March 16, 2012. ^ "License for Nidal Malik Hasan, MD". Virginia Board of Education. Retrieved November 5, 2009. ^ Gearan, Anne (November 6, 2009). "Army: Shooting suspect was bound for Afghanistan". Boston Globe. Retrieved November 6, 2009. ^ a b "Twelve Soldiers Killed". ABC. November 5, 2009. Retrieved November 5, 2009. ^ BBC News, Profile: Major Nidal Malik Hasan, October 12, 2010. ^ "Fort Hood trial turns bizarre as shooter grills witnesses". Foxnews.com. August 6, 2013. Retrieved August 29, 2013. ^ "The Quranic World View As It Relates to Muslims in the U.S. Military" (PDF). NEFA Foundation. Retrieved March 16, 2012. ^ Priest, Dana (November 10, 2009). "Fort Hood suspect warned of threats within the ranks". Washington Post. Retrieved November 10, 2009. ^ Hasan, Nidal (November 10, 2009). "Hasan on Islam". Washington Post. Retrieved November 10, 2009. ^ "Major Nidal Malik Hasan: Soldiers' psychiatrist who heard front-line stories", Ewen MacAskill, The Guardian, November 6, 2009. ^ "Fox video: Fight against the aggressor". Fox News. May 1, 2011. ^ Officials Begin Putting Shooting Pieces Together, NPR, November 6, 2009. ^ Ali, Wajahat (November 6, 2009). "Fort Hood has enough victims already". The Guardian. London. Retrieved November 6, 2009. ^ "Aunt: Fort Hood shooting suspect asked for discharge". The Washington Post. November 5, 2009. Retrieved November 5, 2009. ^ "Muslim Veterans Group Says No Reports of Harassment of Islamic Soldiers". Fox News. November 6, 2009. Retrieved November 6, 2009. ^ James Hider and Philippe Naughton, "Fort Hood gunman Major Nidal Hasan had been trying to leave 'anti-Muslim' Army", Times Online, November 6, 2009. ^ Mcfadden, Robert D. (November 6, 2009). "Suspect Was to Be Sent to Afghanistan". The New York Times. Retrieved November 6, 2009. ^ Mcauliff, Michael; Kerry Burke; Helen Kennedy (November 6, 2009). "Fort Hood killer Nidal Malik Hasan opposed wars, so why did he snap?". New York Daily News. Retrieved November 10, 2009. ^ "Sources Identify Major as Gunman in Deadly Shooting Rampage at Fort Hood". Fox News. November 5, 2009. Retrieved November 6, 2009. ^ Jayson, Sharon; Reed, Dan; Johnson, Kevin (November 5, 2009). "Military: Fort Hood suspect is alive". USA Today. Retrieved November 6, 2009. ^ Fort Hood shooting: Texas army killer linked to September 11 terrorists, The Daily Telegraph, November 7, 2009. ^ Alleged Shooter Tied to Mosque of 9 / 11 Hijackers, The New York Times, November 8, 2009. ^ a b Sherwell, Philip; Alex Spillius (November 7, 2009). "Fort Hood shooting: Texas army killer linked to September 11 terrorists". The Daily Telegraph. London. Retrieved November 10, 2009. ^ a b Shane, Scott and Dao, James; Tangle of Clues About Suspect at Fort Hood, New York Times, November 14, 2009. Retrieved November 14, 2009. ^ Ross, Brian, and Schwartz, Rhonda, "Major Hasan's E-Mail: 'I Can't Wait to Join You' in Afterlife; American Official Says Accused Shooter Asked Radical Cleric When Is Jihad Appropriate? ", ABC News, November 19, 2009. Retrieved November 19, 2009. ^ "Official: Nidal Hasan Had "Unexplained Connections" – ABC News". ABCnews.go. Retrieved March 1, 2010. ^ a b c Raghavan, Sudarsan (November 16, 2009). "Cleric says he was confidant to Hasan". The Washington Post. Retrieved March 23, 2010. ^ a b c Drogin, Bob; Faye Fiore (November 7, 2007). "Retracing steps of suspected Fort Hood shooter, Nidal Malik Hasan". Los Angeles Times. Retrieved November 7, 2009. ^ "Fort Hood Shooter Feared Impending War Deployment". Fox News. November 5, 2009. Retrieved November 5, 2009. ^ ""Inside the Apartment of Nidal Hasan; Business Card", Time Magazine, accessed November 21, 2009". Time. November 11, 2009. Retrieved March 23, 2010. ^ "Hasan Called Himself 'Soldier of Allah' on Business Cards". Foxnews.com. November 12, 2009. Retrieved August 29, 2013. ^ "Ft. Hood gunman Maj. Nidal Hasan gave himself radical Muslim title on business cards". Daily News. New York. November 12, 2009. Retrieved March 23, 2010. ^ Esposito, Richard; Mary-Rose Abraham; Rhonda Schwartz (November 12, 2009). "Major Hasan: Soldier of Allah; Many Ties to Jihad Web Sites". ABC News. Retrieved November 13, 2009. ^ Hsu, Spencer S. (November 8, 2009). "Links to imam followed in Fort Hood investigation". Washington Post. Startribune.com. Retrieved April 2, 2013. ^ a b Jakes, Lara (November 5, 2009). "AP sources: Authorities had concerns about suspect". Associated Press. Retrieved April 2, 2013. ^ "Esposito, Richard, Cole, Matthew, and Ross, Brian, "Officials: U.S. Army Told of Hasan's Contacts with al Qaeda; Army Major in Fort Hood Massacre Used 'Electronic Means' to Connect with Terrorists", ABC News, November 9, 2009, accessed November 10, 2009". ABCnews.go. Retrieved March 23, 2010. ^ Martha Raddatz, Brian ross, Mary-Rose Abraham, Rehab El-Buri, Senior Official: More Hasan Ties to People Under Investigation by FBI, November 10, 2009. ^ a b "E-Mails From Maj. Nidal Malik Hasan". The New York Times. August 20, 2013. ^ a b Hess, Pamela (November 21, 2009). "Levin: More e-mails from Ft. Hood suspect possible". Associated Press. Retrieved December 18, 2013. ^ "Ross, Brian, and Schwartz, Rhonda, "Major Hasan's E-Mail: 'I Can't Wait to Join You' in Afterlife; American Official Says Accused Shooter Asked Radical Cleric When Is Jihad Appropriate? ", ABC News, November 19, 2009, accessed November 19, 2009". ABCnews.go. Retrieved March 23, 2010. ^ "FBI reassessing past look at Fort Hood suspect". Associated Press. November 10, 2009. Archived from the original on November 14, 2009. ^ ""Hasan's Ties Spark Government Blame Game", CBS News, November 11, 2009, accessed January 21, 2010". Cbsnews.com. November 11, 2009. Retrieved March 23, 2010. ^ "Senior Official: More Hasan Ties to People Under Investigation by FBI". ABCnews.go. November 10, 2009. Retrieved March 16, 2012. ^ "Rayner, Gordon, "Muslim groups 'linked to September 11 hijackers spark fury over conference'; A Muslim group has provoked outrage after inviting an extremist linked to the 9/11 hijackers to speak at a conference which is being promoted with a picture of New York in flames"". The Daily Telegraph. UK. December 27, 2008. Retrieved March 23, 2010. ^ "Keynote Address at GEOINT Conference by Charles E. Allen, Under Secretary for Intelligence and Analysis /Chief Intelligence Officer", Department of Homeland Security. ^ a b c d Egerton, Brooks (November 29, 2009). "Imam's e-mails to Fort Hood suspect Hasan tame compared to online rhetoric". The Dallas Morning News. Retrieved December 1, 2009. ^ Kates, Brian, "Radical imam Anwar al-Aulaqi: Fort Hood gunman Nidal Hasan 'trusted' me, but I didn't spark rampage", The New York Daily News, November 16, 2009. Retrieved November 16, 2009. ^ "Sacks, Ethan, "Who is Anwar al-Awlaki? Imam contacted by Fort Hood gunman Nidal Malik Hasan has long radical past", New York Daily News, November 11, 2009, accessed December 10, 2009". Daily News. New York. November 11, 2009. Retrieved March 23, 2010. ^ Zwahlen, Cyndia (May 6, 2009). "Barnes, Julian E., "Gates makes recommendations in Ft. Hood shooting case", The Los Angeles Times, January 15, 2010, accessed January 17, 2010". Los Angeles Times. Retrieved March 23, 2010. ^ Gibbs, Nancy (November 11, 2009). "The Fort Hood Killer: Terrified ... or Terrorist?". Time. Retrieved November 12, 2009. ^ Mattingly, David; Hernandez, Victor (November 9, 2009). "Fort Hood soldier: I 'started doing what I was trained to do'". CNN. Retrieved November 12, 2009. ^ Christenson, Sig (October 14, 2010). "Chilling testimony at Fort Hood hearing". San Antonio Express-News. Retrieved January 15, 2011. ^ Merrick, James L. (May 30, 2005). The Life And Religion Of Mohammed As Contained In The Sheeah Traditions Of The Hyat Ul Kuloob. Kessinger Publishing. p. 423. ISBN 978-1-4179-5536-7. ^ Joseph Thomas (2013). The Universal Dictionary of Biography and Mythology: A-clu. Cosimo, Inc. p. 68. ISBN 978-1-61640-069-9. ^ Mckinley Jr., James (November 12, 2009). "Second Officer Gives an Account of the Shooting at Ft. Hood". New York Times. Retrieved November 12, 2009. ^ Breed, Allen G.; Carlton, Jeff (November 6, 2009). "Soldiers say carnage could have been worse". Military Times. Retrieved November 7, 2009. ^ McCloskey, Megan, "Civilian police officer acted quickly to help subdue alleged gunman", Stars and Stripes, November 8, 2009. ^ Root, Jay (Associated Press), "Officer Gives Account of the Firefight At Fort Hood", Arizona Republic, November 8, 2009. ^ Ashley Powers, Robin Abcarian & Kate Linthicum (November 6, 2009). "Tales of terror and heroism emerge from Ft. Hood". Los Angeles Times. Retrieved November 6, 2009. ^ Barnes, Julian (November 6, 2009). "Fort Hood victims bound for Dover Air Force Base". LA Times. Archived from the original on November 8, 2009. Retrieved November 6, 2009. ^ "Major Nidal Malik Hasan's Jihad warning signs ignored by politically correct military – Fort Hood", CNN, November 6, 2009. ^ Newman, Maria (November 5, 2009). "12 Dead, 31 Wounded in Base Shootings". The New York Times. Retrieved November 5, 2009. ^ "Neighbors: Alleged Fort Hood gunman emptied apartment". Fort Hood, Texas: CNN. November 6, 2009. Retrieved November 6, 2009. ^ "Who is Maj. Milik Hasan?". KXXV. November 6, 2009. Retrieved November 6, 2009. ^ Pasha, Kamran (November 6, 2009). "A Muslim Soldier's View from Fort Hood". Huffington Post. Retrieved November 9, 2009. ^ Carlton, Jeff (November 6, 2009). "Ft. Hood suspect reportedly shouted `Allahu Akbar'". Associated Press. Archived from the original on November 7, 2009. Retrieved November 6, 2009. ^ "Terrorism or Tragic Shooting? Analysts Divided on Fort Hood Massacre". Fox News. November 7, 2009. Retrieved November 8, 2009. The authorities have not ruled out terrorism in the shooting, but they said the preliminary evidence suggests that it wasn't. ^ "Hospital: Fort Hood suspect moved to San Antonio". The Guardian. London. Associated Press. November 6, 2009. Retrieved November 6, 2009. ^ Boudreaux, Richard (November 7, 2009). "Ft. Hood shooting suspect endured work pressure and ethnic taunts, his uncle says". Los Angeles Times. Retrieved November 7, 2009. ^ Todd, Brian; Ed Lavandera (November 13, 2009). "Alleged Fort Hood shooter paralyzed from waist down, lawyer says". CNN. Retrieved November 13, 2009. ^ Jeremy Pelofsky, Adam Entous, Fort Hood suspect refuses to talk, iol.co.za, November 10, 2009. ^ Fort Hood Suspect Faces New Charges; the New York Times, December 2, 2009. Retrieved December 2, 2009. ^ "Military Charges Hasan With 13 Counts of Murder, Excludes Unborn Baby's Death". lifenews.com. November 12, 2009. ^ Associated Press and Angela Brown, Fort Hood Suspect Charged with Murder; cnn.com, December 2, 2009. Retrieved April 2, 2013. ^ a b Brown, Angela K.; Gearan, Anne (December 12, 2009). "Official: Prosecutor named in Fort Hood case". Army Times. Retrieved December 12, 2009. ^ Roupenian, Elisa (November 9, 2009). "Retired Colonel to Defend Accused Fort Hood Shooter: Accused Shooter Nidal Hasan Awake and Talking to Hospital Staff". Abcnews.go.com. Retrieved August 29, 2013. ^ "Attorney: Hasan ordered confined until trial". Army Times. November 22, 2009. ^ Brown, Angela K. (November 23, 2009). "Atty: Hood suspect may use insanity defense". Army Times. Retrieved November 24, 2009. 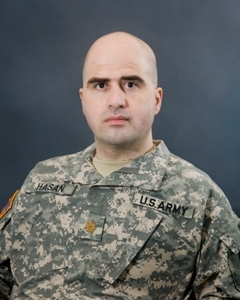 ^ "Army will delay mental evaluation of Hasan". The Army Times. January 28, 2010. Retrieved February 6, 2010. ^ "Lawyer: Hasan barred from praying in Arabic". December 22, 2009. Retrieved February 6, 2010. ^ Bell County (TX) Jail. "Bell County – Daily Active Inmates". Archived from the original on March 1, 2010. Retrieved April 7, 2010. ^ a b c CNN Wire staff (April 29, 2010). "Death penalty sought for Fort Hood shooting suspect". CNN. Retrieved April 29, 2010. ^ "Ft. Hood shooting suspect solemn, quiet in hearing". Daily Caller. June 1, 2010. Retrieved December 18, 2013. ^ "Hassan's Attorney Seeks Closed Court Hearing". Tyler Morning Telegraph. Tyler, Texas. September 16, 2010. pp. 5B. ^ Zucchino, David (October 13, 2010). "Hearing delayed in Ft. Hood shooting case". Los Angeles Times. Retrieved March 16, 2012. ^ Zucchino, David (October 15, 2010). "More wounded soldiers recount horrors of Ft. Hood rampage". Los Angeles Times. Retrieved March 16, 2012. ^ Zucchino, David (November 16, 2010). "Lawyers for Ft. Hood suspect decline to put on a defense". Los Angeles Times. Retrieved January 16, 2011. ^ Zucchino, David (November 18, 2010). "Army colonel recommends trial, death penalty in Fort Hood shooting". Los Angeles Times. Retrieved January 16, 2011. ^ Eli Lake (July 6, 2011). "Hasan eligible for death penalty at court-martial". The Washington Times. ^ "Judge sets 2012 trial date in Fort Hood shooting case". July 29, 2011. ^ "Trial for accused Fort Hood shooter delayed". CNN. samachar.com. February 2, 2012. Archived from the original on May 2, 2014. Retrieved May 2, 2014. ^ "Timeline for Judicial Process". Fort Hood Press Center. ^ "Judge: Fort Hood suspect could be shaved". Army Times. Associated Press. July 25, 2012. Retrieved August 6, 2012. ^ Angela K. Brown (August 3, 2012). "Fort Hood shooting suspect fined by judge once more after again showing up in court with beard". Washington Post. Archived from the original on December 7, 2018. Retrieved August 6, 2012. ^ Angela K. Brown (August 15, 2012). "Not guilty pleas expected in Fort Hood case". Army Times. Retrieved August 16, 2012. ^ Angela K. Brown (August 16, 2012). "Fort Hood Suspect's Trial on Hold Over Beard". ABC News. Retrieved August 16, 2012. ^ Karen Brooks (August 27, 2012). McCune, Greg; Eastham, Todd (eds.). "Military says trial of accused Fort Hood shooter can go ahead". Chicago Tribune. Reuters. Retrieved August 27, 2012. ^ Manny Ramirez (September 6, 2012). "Fort Hood Shooting Suspect's Beard Must Be Shaved, Military Judge Rules". San Francs. Retrieved September 17, 2012. ^ a b Angela K. Brown (September 6, 2012). "Hasan ordered shaved; trial delayed". Austin Statesmen. Associated Press. Retrieved April 2, 2013. ^ "Lt. General says Hasan still has rank, getting paycheck – KXXV-TV News Channel 25 – Central Texas News and Weather for Waco, Temple, Killeen |". Kxxv.com. Retrieved March 16, 2012. ^ "Fort Hood accused Hasan 'can represent himself'". BBC. June 3, 2013. Retrieved June 3, 2013. ^ Forsyth, Jim (June 3, 2013). "udge rules Fort Hood suspect can represent himself". Reuters. NBCNews. Retrieved June 16, 2013. ^ Johnson, M. Alex (June 14, 2013). "Fort Hood gunman Nidal Hasan banned from arguing he was defending the Taliban". NBCNews. Retrieved June 16, 2013. ^ Herridge, Catherine; Browne, Pamela (July 26, 2013). "Accused Fort Hood shooter releases statement to Fox News". Fox News. Retrieved July 28, 2013. ^ Allen, Nick (August 6, 2013). "I am the shooter: US army major Nidal Hasan declares as he faces court martial over Fort Hood massacre". The Daily Telegraph. London. The Telegraph (UK). Retrieved August 8, 2013. ^ Merchant, Nomaan; Weber, Paul (August 8, 2013). "Nidal Hasan Cross-Examination: Fort Hood Shooting Suspect Asks No Questions Of First Victim". The Huffington Post. Retrieved August 8, 2013. ^ "Attorneys allowed to leave trial of Fort Hood shooting suspect Nidal Hasan". The Guardian (UK). August 9, 2013. Retrieved August 10, 2013. ^ DeLong, Katie (August 8, 2013). "Judge says Nidal Hasan defense team not allowed to opt out". Fox6 Now.com. Retrieved August 10, 2013. ^ "Nidal Hasan's attorneys still trying to leave case". CNN. August 10, 2013. Retrieved August 11, 2013. ^ Jonsson, Patrik (August 14, 2013). "Seeking martyrdom, Nidal Hasan raises little fuss in Fort Hood courtroom". The Christian Science Monitor. Retrieved August 16, 2013. ^ Merchant, Nomaan; Graczyk, Mike (August 14, 2013). "Massacre accused wants execution". The Nelson Mail. Retrieved August 16, 2013. ^ Johnson, Eric; Garza, Lisa (August 15, 2013). "Report on Fort Hood shooter blocked". Stuff.co.nz. Retrieved August 16, 2013. ^ "Jude Osborn rules out evidence of early extremism". UPI.com. August 19, 2013. ^ Graczyk, Michael; Weber, Paul (August 20, 2013). "Nidal Hasan, Suspect in Fort Hood Shootings, will get his turn in court waits". Huffington Post. ^ Graczyk, Michael; Weber, Paul (August 21, 2013). "Defending Himself, Nidal Hasan Rests Fort Hood Case With No Witnesses". Time. TIME Magazine. ^ "No defense from suspect in 2009 Fort Hood shooting". Yahoo News. Retrieved August 21, 2013. ^ "Hasan declines to give closing argument in Fort Hood shooting rampage trial". Fox News. August 22, 2013. Retrieved August 22, 2013. ^ Fernandez, Manny (August 28, 2013). "Jury Sentences Hasan to Death for Fort Hood Rampage". New York Times. Retrieved August 28, 2013. ^ "Fort Hood shooting jury recommends death penalty for Nidal Hasan". Cnn.com. November 5, 2009. Retrieved August 29, 2013. ^ Kenber, Billy (August 24, 2013). "Nidal Hasan convicted of Fort Hood killings". Washington Post. Retrieved August 23, 2013. ^ Penalty phase of Ft. Hood court-martial: prosecution rests. Fox News. 2013. Retrieved August 27, 2013. ^ "Fort Hood gunman Maj. Nidal Hasan sentenced to death". Fox News. November 5, 2009. Retrieved August 29, 2013. ^ "Fort Hood shooter Nidal Hasan addresses court-martial panel with few words". CNN. August 27, 2013. Retrieved August 28, 2013. ^ Girdon, Jennifer (August 27, 2013). "Fort Hood shooter Nidal Hasan rests case without speaking at sentencing phase of trial". Fox News. Retrieved August 28, 2013. ^ "Fort Hood gunman Maj. Nidal Hasan sentenced to death". Fox News. August 28, 2013. Retrieved August 28, 2013. ^ "Fort Hood Gunman Nidal Hasan Sentenced To Death For 2009 Attack". NPR News. Retrieved August 28, 2013. ^ "American Muslim Cleric Praises Fort Hood Shooter, ADL, November 11, 2009, accessed January 21, 2010". Adl.org. Archived from the original on November 29, 2009. Retrieved March 23, 2010. ^ Shane, Scott; "Born in U.S., a Radical Cleric Inspires Terror", The New York Times, November 18, 2009. Retrieved November 20, 2009. ^ "NEFA transcript" (PDF). Retrieved March 16, 2012. ^ a b c "Fort Hood Shooting is Praised Online as Act of Heroism". Adl.org. Archived from the original on July 20, 2012. Retrieved March 16, 2012. ^ "Peaceful preaching inside, violent message outside a New York mosque". CNN. November 5, 2009. ^ a b Allen, Nick (November 8, 2009). "Allen, Nick, "Fort Hood gunman had told US military colleagues that infidels should have their throats cut", The Telegraph, November 8, 2009, retrieved November 9, 2009". The Daily Telegraph. London. Retrieved March 23, 2010. ^ Whitelaw, Kevin (November 6, 2009). "Massacre Leaves 13 Dead At Fort Hood". NPR. Retrieved April 2, 2013. ^ Eggerton, Brooks (November 17, 2009). "Fort Hood captain: Hasan wanted patients to face war crimes charges". Dallas Morning News. Retrieved November 17, 2009. ^ "Casey: I'm 'concerned' about backlash against Muslim soldiers". CNN. November 8, 2009. ^ "'Meet the Press' transcript for Nov. 8, 2009, George Casey, Haley Barbour, Ed Rendell, David Brooks, E.J. Dionne, Rachel Maddow, Ed Gillespie, Tom Brokaw". February 12, 2010. ^ "Ex-F.B.I. Director to Examine Ft. Hood"; The New York Times, published and retrieved on December 8, 2009. ^ "Final Report of the William H. Webster Commission on The Federal Bureau of Investigation, Counterterrorist Intelligence, and the Events at Fort Hood, Texas, on November 5, 2009". Federal Bureau of Investigation. Archived from the original on July 22, 2012. ^ Johnson, Bridget (November 9, 2009). "Lieberman wants probe into 'terrorist attack' by major on Fort Hood". The Hill. Retrieved November 9, 2009. ^ "Table of Contents: November 23, 2009". Time Magazine. November 23, 2009. Retrieved November 22, 2009. ^ a b c "The Fort Hood Killer: Terrified ... or Terrorist?". Nancy Gibbs. Time magazine. November 11, 2009. ^ Patrik Jonsson and Tracey D. Samuelson, "Fort Hood suspect: Portrait of a terrorist? ", Christian Science Monitor, November 9, 2009. ^ a b Scott, Shane & Dao, James (November 14, 2009). "Investigators Study Tangle of Clues on Fort Hood Suspect". The New York Times. Retrieved November 22, 2009. ^ "Nidal Hasan's beard shaved off by force". The Guardian. September 4, 2013. Retrieved September 6, 2013. ^ Shaughnessy, Larry (September 5, 2013). "Nidal Hasan's beard shaved off at Fort Leavenworth Prison". CNN. Retrieved September 6, 2013. ^ Zaimov, Stoyan (September 5, 2013). "Military forcefully shaves Nidal Hasan's beard; Lawyer to sue". The Christian Post. Retrieved September 6, 2013. ^ Carter, Chelsea (August 29, 2014). "Fort Hood shooter writes to ISIS leader, asks to become 'citizen' of Islamic State". CNN. Retrieved August 29, 2014. ^ Herridge, Catherine (August 28, 2014). "Fort Hood shooter says he wants to become 'citizen' of Islamic State caliphate". Fox News. Retrieved August 29, 2014. Wikimedia Commons has media related to Nidal Malik Hasan. This page was last edited on 14 April 2019, at 20:33 (UTC).